Add excitement & fun to keep the fire going with this quick & easy date night jar. Enjoy a creative date night now on a weekly basis for 12 months of dates. Sound familiar? Ah yes, the classic date night conversation. It’s a close second to the “Where do you want to eat?” debate. There’s nothing worse than a date night rut. Date nights can be a rare occurrence and can quickly become extinct if you always stick to the same old dinner and a movie routine. So how in the world do we keep from falling into a rut….or even worse, running out of ideas? 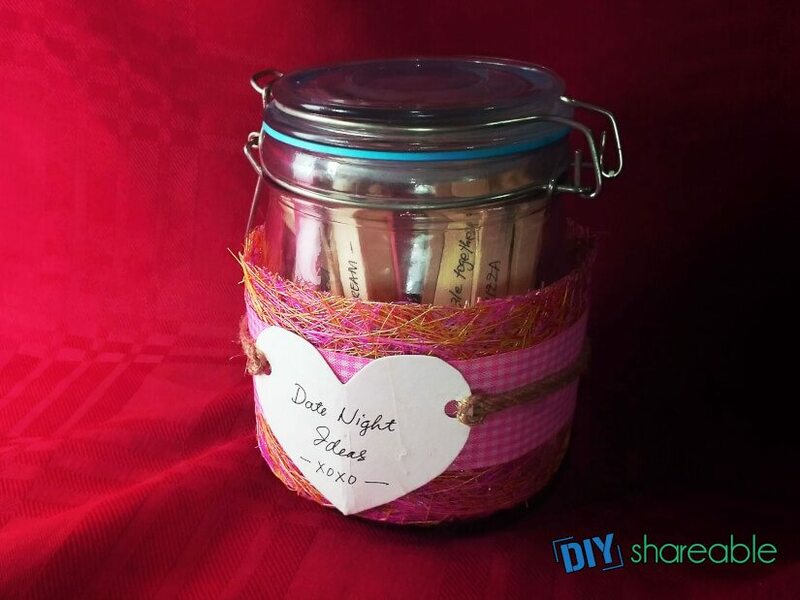 Create a date night jar! Around our anniversary, we will sit down and write date night ideas on popsicle sticks. We prefer not to share the ideas with each other, so the other person can be surprised when they pick the activity for the night. I also always keep extra popsicle sticks by the jar so that if inspiration strikes, we can add to the jar. We rarely run out of ideas before the next anniversary rolls around! What kind of dates has the jar brought us? Ziplining through the trees, an improv comedy club, and paint night are a few. We’ve also enjoyed ice skating, go karting and an MLS soccer game. We’re pretty active (and competitive!) so our date nights reflect that. If you’re more of an artsy couple you might enjoy a gallery opening, wine tasting, or a symphony performance. Or, you might sign up for some couples cooking classes. What you do isn’t as important as doing it together. Keep your relationship fresh and exciting by spicing things up with a date night jar. Cut a wide strip of the recycled scrapbooking paper, just wide enough to cover no more than 80% of the jar and long enough to wrap around it once. Next, cut a piece of ribbon the same length as your paper. Using a hot glue gun and a hot glue stick, secure the scrapbooking sheet around the jar. As always, be careful when handling the hot glue. It can seep out of the material and cause burns. Now take your length of ribbon and glue it around the jar over the recycled sheet. It doesn’t take long for the glue to dry. In the meantime, cut a heart shape out of the piece of cardboard. This can be an old shirt box, the cover of an old notebook, or anything that has a clean white side. Punch holes on the two sides of the heart, which will become the sign on the side of your date jar. Pick a cute title and write it on the heart. Date Night Ideas, First Date Friday Nights, and Romantic Rendezvous are just a few suggestions you might use. Attach twine to each side of the heart through the two holes you punched earlier. Make sure your pieces of twine are long enough to tie around the jar! Glue the heart to the jar and make a knot on the back. Time for the most important part…..Prepare your popsicle sticks! This is where you can get creative. Decide how you want to split up your sticks. You could choose to have one person write on all the pink sticks and the other use the plain. Or you could do cheap/free date night ideas on one color and fancier ideas on the other. We like to use one color for our active dates and the other for the tamer dates like painting, a walk on the beach, or ice cream. The choice really is yours and there isn’t a wrong or right way to do it. 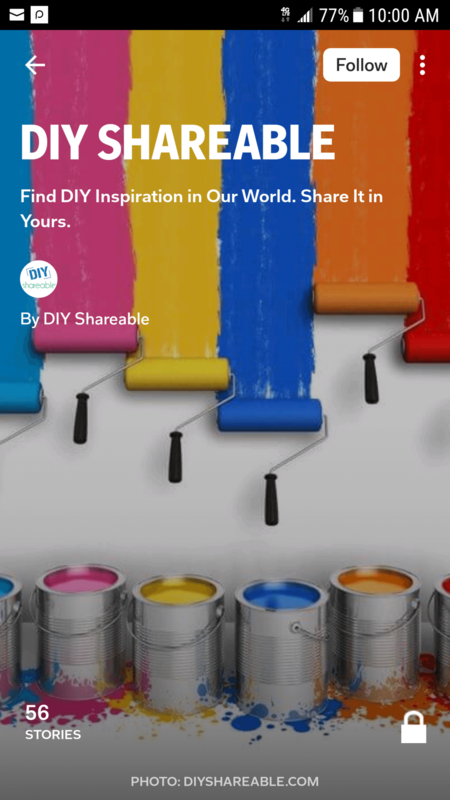 You’ll have 25 of each color in the jar so no matter what, you should end up with a great variety of ideas. Place the sticks in the jar and get ready for your next date night destination! By combining ideas from both of you, it keeps you from always doing the same thing or doing things you don’t even enjoy. Some of our favorite and best date nights have come from those surprises the other person chose. Take turns picking from the jar and occasionally keep the destination and the activity a surprise. Just let the other person know how to dress or what to bring! Even better – pack a bag for them, stash it in the car, and blindfold them until you’re there. There’s no better gift than opening your eyes and realizing you’re in a beachfront hotel for the night or watching your favorite sports team play live! Don’t let your relationship get boring – perk it up with fun, easy ideas that draw you closer together and keep the fire going!